It's 1981, a year of riots and royal weddings. The Dukes of Hazzard is on TV. Curly Wurlys are in the shops. And trying to find a place in it all is nine-year-old Leon. He and his little brother Jake have gone to live with Maureen. They've lost one home, but have they found another? Switch back and forth between reading the Kindle book and listening to the Audible narration. Add narration for a reduced price of $11.99 after you buy the Kindle book. A brother chosen. A brother left behind. And a family where you'd least expect to find one. This is another book club selection that I might well have passed over or ignored. It all sounded a bit trite - solo mum not coping, heroic boy child manages the burden, child goes into care, boy confused and lost in system, boy found by caring and kind foster mother. Boy loses only other family, a brother to adoption, and brown boy attempts to survive a variety of horrible and painful events. Of course he starts to wander and pilfer coins and of course he falls into what might be bad company. The story is sad and remains gripping, even though we’ve heard these stories before. This is Britain during the race riots and it is mighty tough for those on the bottom of the heap. Leon tells his own story with great clarity. You can hear his fear and hatred, and you can feel his terrible losses. This is a good book to read, and I would strongly recommend it. Talk about having the deck stacked against you. England, 1980. Leon’s mum, Carol, has had two boys to different fathers. His walked out when she was pregnant with his baby brother, Jake, whom he adores. Jake’s father is married, and Leon overhears him refuse to have anything to do with Carol or the baby. Carol loses the plot and accuses Leon of being the reason Jake’s father shot through. That’s exactly how kids think. You don’t care about me, so I’ll show you - SO THERE! Leon takes care of infant Jake as mum sinks into a bed-ridden breakdown. He changes nappies, makes formula, and keeps him happy, all the while feeding himself and trying to get his mum to get out of bed. He’s only 8 years old, for Heaven’s sake, and he’s managing a household. . . until he runs out of food, nappies and money. His mum’s girlfriend discovers the squalor in their flat and calls Social Services. Thus begins the next phase of Leon’s growing up. Maureen is a cheery, round foster carer who takes a shine to these two, but baby Jake is white, adoptable and in demand, so off he goes to a new family. Oh yeah, sorry, Leon. You’re older and too dark, but here’s a nice photo of you both to remember him by. Like a lot of kids, he listens to adult conversations when they think he’s busy playing or watching TV, so he picks up bits and pieces and concludes he’s a nuisance and nobody cares about him. All he wants is to fill his rucksack with important worldly goods and find his little brother. Unbeknownst to his foster carer, he begins hanging around the allotments, where people have patches of land to grow veggies and build little sheds. He doesn’t think they care about him either, but it’s kind of fun with a real mixed bag of characters. He gets a taste of freedom and of what it is to be a black kid when there are street riots. It’s a poignant, believable look into the heart of a young boy who just needs a place to belong. I think Young Adults would relate to this, too. Thanks to NetGalley and the publisher, Penguin Books UK, for my advanced review copy. I look forward to more from this author. Scramble the letters and you get LONE - the underlying theme of this book being the loneliness and isolation perpetrated on a child unwittingly thrust into the arms of the social welfare system. But don't let this put you off, because it is a really good read. Good story, great character in little Leon and written with such love and tenderness. Leon is nine years old. He lives with his drug addict mother Carol and baby half brother Jake. Carol is white, Leon's absent father is black, Jake's married father is white, also absent. A mess of mammoth proportions in the making. Carol is increasingly incapable of caring for the children and Leon is thrust into the role of parent until, unsurprisingly, everything falls apart. Jake and Leon are taken into care, to the most wonderful arms of Maureen, long time foster parent with expert intuition in caring for damaged children such as Leon. Unfortunately for Leon, no one wants to adopt mixed race 9 year old boys, but a white year old baby boy is a different story, and it isn't long before, tragically, the two children are separated. For Leon, life goes from bad to worse, angry, confused, alone, completely lost and distraught. By chance he finds an allotment in the neighbourhood and befriends a number of the people who garden there. His new friends have their own problems and he slowly finds himself drawn into their world, without really understanding what it is all about. Leon is a most endearing child, intelligent, wanting to please, loving and responsive - just a normal average little boy wanting to live in a family with a mum, dad and brother. Such a simple want, so impossibly hard to achieve. Set in the early 1980s, against the background of Charles and Di's wedding, suburban race riots, Margaret Thatcher's economic policies, and a social welfare system simply unable to cope with what it is tasked with, this book will break your heart. Told entirely from Leon's point of view, he is trying to make sense of the turns his life takes - losing his brother, unable to understand what is wrong with his mother, hating the social workers controlling his life, but unable to escape it. His story will be similar to the stories of many, many other children. The author writes her story with plenty of first hand experience of being mixed race herself, growing up in a household where her Irish mother fostered many children, working in social services for a time where one of her jobs was to look at the experiences of black children who had been fostered to white foster parents, and the foster system as a whole. Apparently separating siblings was very common in the 1980s. I wonder how many tears she cried while writing this, although the book is written with an undertone of anger and rage at the system. This book should be absolutely compulsory reading for anyone involved in the care of children and families in the social services/justice system. Written with such insight, compassion and tenderness, it puts the child at the top of the care model. Here in New Zealand we are constantly having paraded before us in the media on a weekly basis children who have been maltreated, abused, neglected, killed, passed around from foster carer to foster carer, chucked out on their 18th birthdays to fend for themselves. It is disgraceful. 5.0 out of 5 starsHeart-breaking but very impressive! I am little bit heart-broken and a lot impressed. This was a heart-breaking and at the same time heart-warming tale of a mixed race boy growing up in 1980’s Britain. My heart broke for Leon losing first his mother to her various problems and his home, and then losing the brother upon whom he doted. There are some lovely characters, especially Maureen and Sylvia, whose compassion and warmth are beautiful. 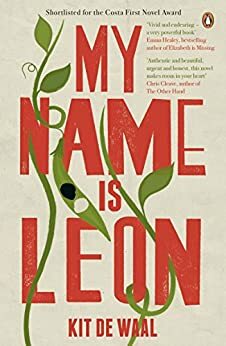 This could have been a bleak read but the author has provided a delightful story with witty moments to offset the absolute sadness of Leon’s situation. This is a book that will stay with me for a long time. From the first few pages of this extraordinarily written novel, I was hooked. Since I’m renowned for my lack of interest in children, that speaks very highly of Kit de Waal’s writing style. She’s written a book for an adult audience entirely from a child’s perspective, and it’s engaging and mature. The protagonist is Leon, a young black boy in England, whose mother is so incompetent and disinterested, she loses custody of her children. Leon is thrown into foster care, along with his infant half-brother whom he loves dearly and feels duty-bound to care for. While Leon’s brother is deemed adoptable because of his skin color and age, Leon is looked at as a lost cause. The boys are separated, and Leon has to adjust to a completely new world he has no control over and doesn’t understand. It’s a brilliant concept, and one that could have gone horribly wrong had it not been so carefully crafted and treated with kindness. The story is painfully realistic, and characters who could have been turned into evil stereotypes are given life. The book does take a surprising turn by introducing a political English environment, so be prepared if you decide to read this book that a large chunk of the novel seems incongruous with Leon’s relationships within the foster care system. I wasn’t prepared, and it wasn’t until I’d finished the book and read a question-and-answer section with the author that I understood why she included it. I still enjoyed the family and foster sections much better, and but there are probably many other readers who would understand the connection sooner than I did and therefore wouldn’t mind it. Deep-feeling readers who see characters becoming real will enjoy this book, since even I came to believe Leon was a real boy. I would actually love to see middle school to high school students read this and see the world in a different light. Almost thru their own eyes that haven't yet opened up. To be able to trust, see hope, know there are people out there that care and need caring. But then again it may make the ones that have no hope, no salvation angry. It's conflicting. 4.0 out of 5 starsThe child’s voice comes across well. An engaging read told from the point of view of Leon an eight year old boy who we meet as he visits his mother in hospital as she has given birth to his new brother Jake. Leon adores his mother and his brother and as his home life is chaotic he believes he can look after them both , but as things go from bad to worse he has to ask for help which changes his life forever. The child’s voice comes across very well. I read the description and was reluctant to read on this day, having had experiences on both sides of adoption. I was having a day that needed uplifting! Started a sample earlier today and finished the book. I was so engaged by Leon and his story. Amazing character definition I could hear and see them all. Love and sadness and just real life, I couldnt put it aside, and yes the realness was uplifting and thought provoking through the voice of a child. Very good story about a child in foster care. It is a good story, by which I mean that the things that happen to Leon in Foster Care are primarily good and I think that is not the typical experience of a foster care child. But it is well written and Leon survives the system which is heartening.